World Humand Dimension considers that Climate Change is one of the major problems to be featuring in the UN Agenda within the framework of Sustainable Development. One of the most anticipated events of the Fall of 2015, the United Nations Climate Change Conference started on the 30th of November in Le Bouget, a suburb of Paris. It is the 21st yearly session of the Conference of the Parties to the 1992 United Nations Framework Convention on Climate Change (UNFCCC), and the 11th session of the Meeting of the Parties to the 1997 Kyoto Protocol. UN Secretary-General Ban Ki-Moon, Russian President Vladimir Putin, American President Barack Obama and the UK Prime Minister David Cameron were among 151 world leaders attending the Conference this year. 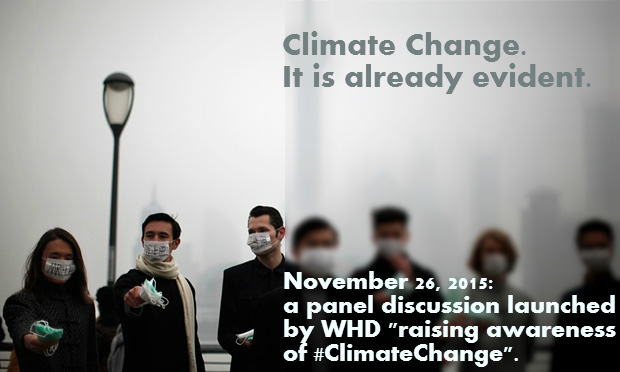 On November 26th World Human Dimension hold a panel discussion on Climate Change aimed to raise an awareness on the subject among attendees of different backgrounds.